IM+ Pro 9.0.0.7 beta– Won’t you be my Neighbor? If you haven’t heard of SHAPE Services or IM+ Pro, then you obviously haven’t been visiting CrackBerry enough. I’ll forgive you…this time. IM+ Pro is an amazing “all-in-one messenger” app that can be used to chat using Google Talk, AIM, MySpace, Jabber, ICQ, MSN Messenger, Yahoo! Messenger, Facebook, Skype AND Twitter at the same time until your thumbs bleed. In what is being called a “Major Update” in version 9.0.0.7 beta, users can now participate in a new local chat tool called Neighbors. 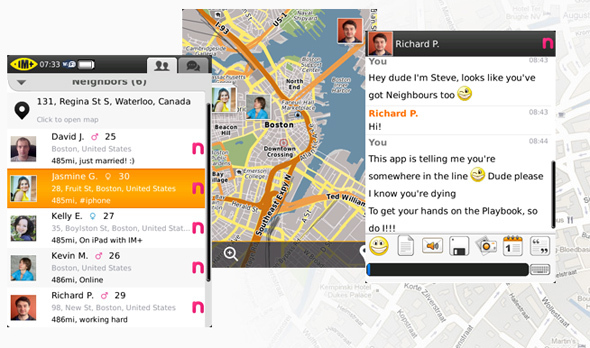 “Neighbors offers a new dimension of communication in IM+ by providing users the opportunityto find new real life connections and friends with common interests. It’s an interesting concept as it almost eliminates the need for meeting new people in person. Who likes doing that anyway? Kidding! At least you can still throw on a cardigan and sneakers when you get home and still meet new friends without visiting the Neighborhood of Make-Believe. The next time you find yourself saying “Oh who are the people in your neighbourhood?” you can answer your own question with Neighborhood found within 9.0.0.7 beta (yes, I referenced both Mr. Roger’s Neighborhood and Sesame Street!). The beta is available for BlackBerry smartphones running OS 5.0 or higher and will be active until June 6th.